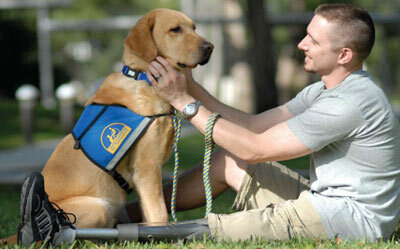 Service dogs are specially trained dogs that provide assistance to individuals that have disabilities. Most commonly these dogs are used by those with hearing or visual impairments. There are also dogs that assist those with mental impairments such as severe depression and post traumatic stress disorder. Specific qualities are looked for when training a service dog. 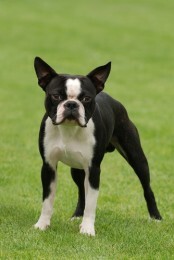 These qualities include good health, good temperament, trainability and bidability. Many times these dogs will be trained by service dog organizations. Any type of dog may be trained as a service dog. These dogs are typically allowed in areas where dogs are generally not allowed. A mobility assistance dog is one that helps individuals that have physical impairments or disabilities. Some common tasks performed by the dog include opening and closing doors, picking up objects and turning lights on and off. Some very large mobility assistance dogs may even wear a harness and pull those that are in wheel chairs. There are also “walker” mobility assistance dogs that are used for those that are recovering from an injury and have Parkinson’s disease. These dogs function like living cane’s and assist the individuals with their balance and gait when walking. Assistance Dog Tasks – A guide to the types of tasks performed by assistance dogs. 4 Paws for Ability – Non-profit organization that trains dogs for mobility assistance. Provides information on the dogs and types of tasks covered during training. Service Animal Registry of America – Registration and certification of therapy and service animals and their trainers found at locations around the world. How Not to Distract Assistance Dogs – Learn the proper etiquette when dealing with assistance dogs. Mira Foundation – Learn about the different disabilities and disorders of which assistance dogs can help with mobility. Signal dogs are also known as hearing dogs and used by those that have a hearing impairment or are deaf. They alert the handler to specific sounds such as alarm clocks, telephone ringing, smoke alarms and doorbells. Outside of the home the dog will also respond to signals such as a person calling the name of the handler, forklifts and sirens. The three main qualities required of signal dogs include the willingness to work, sound reactivity and a good temperament. Training may take as little as three months though many dogs will take an entire year to be trained. Often times these dogs will wear a bright orange collar and leash as identification that they are signal dogs. Hearing & Signal Dogs – Directory of organizations that provide signal dogs or signal dog training. What is a Hearing Dog? – An overview about how hearing dogs help their handlers. Hearing Dogs for Deaf People – National charity that trains dogs to alert deaf people to dangers signals and important sounds. Minimum Standards for Training Hearing Dogs – A description of the minimum standards that hearing dog programs must meet to train signal dogs. Assistance Dogs International, Inc, About Hearing Dogs – Information about the type of assistance provided by hearing dogs. Medical response dogs are those that are trained specifically to help with the handler’s medical disability. These dogs can help with many medical problems but are generally not associated with those that have psychiatric conditions or epilepsy. These dogs will alert the handler to problematic conditions before the handler notices. One example is a medical response dog for a diabetic handler. The dog is trained to detect when the handler’s blood sugar is too low or high. Many dogs are also trained to help with the handler’s symptoms such as bringing a telephone or medications. As with all service dogs any type of dog may be a medical response dog as long as they have a work loving personality and can react properly in social situations. Psychiatric Service Dog Society – A non-profit organization that provides information for those that wish to train dogs for handlers with severe mental illness. Seizure Dogs – Article about dogs that are trained to predict seizures and those that provide assistance during a seizure. Disability Assistance, Medical Response Dogs – Description of how specially trained dogs can assist those with disabilities. FAQ, Disability Assistance Dogs – A list of frequently asked questions and answers on disability assistance dogs. Dogs that Changed the World – The story of two medical dogs and their special talents. Guide dogs or seeing-eye dogs are trained to help those that are visually impaired or blind. These dogs will guide the handler around obstacles, although they cannot interpret street signs because dogs are partially red-green color blind. It is up to the handler to get from one place to the other but it is the dog that will safely pilot the handler along the route. These dogs have been used as far back as the 16th century as several books detail guide dogs. The very first guide dog training school was located in Germany during World War I. these dogs were to help the mobility of solders that were blinded in combat. Unlike the other type of service dogs mentioned there are specific breeds that tend to function very well as guide dogs. German Shepherds, Labradors and golden retrievers are the most popular breeds of dogs to be chosen as guide dogs. Other breeds can be chosen as the shoulder height relationship between the dog and handler is important for the harness to function properly. Labradoodles are very popular as they do not shed and work well for those that have allergies. Mobility International USA – Information on international travel with guide dogs and other service animals. National Association of Guide Dog Users – Part of the National federation of the blind this is a forum for guide dog users, those that want to learn more or those interested in getting a guide dog. Guide Dogs for the Blind – School that pairs those with visual impairments with guide dogs and provides the necessary training for both the dog and handler. About Guide Dogs – Information for young people on how guide dogs can help those that are blind or visually disabled. Guide Dogs of America – Organization that provides fully trained guide dogs to the blind for free.